Despite the fact that it took me a little bit longer to read this book, mainly because I just didn't have the time to, I absolutely loved this book and its slow-burning storyline. 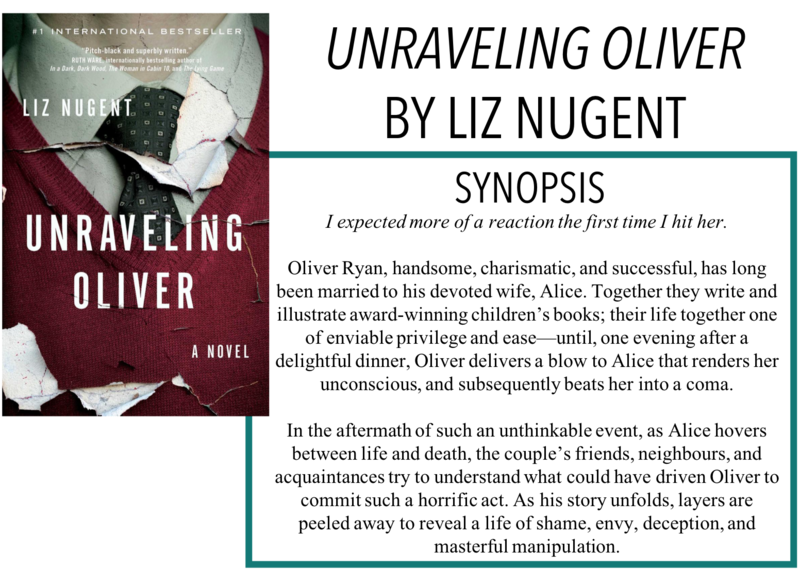 I'm back with another review, Unraveling Oliver by Liz Nugent. Thanks so much to Simon and Schuster Canada for sending me a copy of this book for an honest review, as always, all opinions are my own. The story follows Oliver and his wife Alice. The two are a seemingly delightful children's book writer and illustrator team. However, one night, after a meal prepared by Alice, Oliver attacks Alice with a near-fatal beating. In the wake of this incident, friends, acquaintances, and neighbours delve into the layers of Oliver's past and masterful manipulation. The book initially opens with the jarring beating of Alice. There isn't a lot of details behind a motive at that moment, but as the story progresses and the new perspectives are added, the events of the past begin to explain what really happened. I'm not usually one for a slow-burning thriller/suspense story - mostly because I don't often come across one that has been done well - but Nugent did a phenomenal job with this one. I was immediately intrigued by the premise of the story, but the way it was told and the different perspectives really made for the "unravelling" of Oliver to be an enticing story. Nugent does a really good job of making all the perspectives unique and each has their own voice, while still adding brilliantly to the story. At first, I wasn't too sure how they would all go together and if they would be beneficial to the story, but I really can't imagine the story being told any other way. This was a little different from most thrillers because the 'big reveal' was largely given away at the beginning. We knew Oliver attacked Alice, we just weren't sure why. I suppose the why is the big reveal, but for me, I was more interested in Oliver's life as a whole - how he became the person he did. I really enjoyed how Nugent doesn't try to romanticize Oliver and his abuse - he has had a rough life, but that doesn't excuse him from his actions. There isn't one particular moment that 'created' the monster inside of him, it seems to have always been there. I find a lot of the time, these books create some sort of sad backstory that allows the 'monster' to be absolved of their actions. Nugent just makes it part of Oliver's character. I also loved the Irish setting and details about Ireland in the mid-1900s onward - its a time period I know a bit about and was really excited to read about it. Overall, I really enjoyed this book and I think that it might be one of my new faves!